Good amount of vitamins and minerals make rhubarb highly beneficial and nutritious food for heart, skin, brain, bones, hairs, eyes and digestive system. Rhubarb is also a best source of both minerals and vitamins. Rhubarb is a kind of species from plants in the family of Polygonaceae. It is perennial herb, which is growing from thick, short, and rhizomes. Rhubarb is having larger leaves, which are kind of triangular in shape with long fleshy petioles. They are having small flowers which are grouped in larger compounds of leafs which are greenish and whitish to rose red inflorescences. They are in common considered as vegetables. It is a vegetable, which is based on seasons and are commonly used for the purposes for sauces, pies and pastries. It is one of the best sources for calcium and helps in strengthening of teeth and bones. It also helps in softening of tooth losing and bones. A single cup (122 g) of it is providing around 105 mg of calcium, which is around 10% of the 1000 mg calcium on an average of intake by the adults. It is rich source of lutein, which does takes care of eyes and skin. Eyes and skins are the only one organ, which is exposed to the environment and they would be having some extra nutrients for caring of the human beings. Lutein is helping in getting rid from radical, which could be quite dangerous for customers and could result into cancer. A single cup of it does contain around 207 mg of lutein. It is also rich source of Vitamin K, which helps in forming blood clots when someone is injured. If a person is having deficiency of Vitamin K, the blood of person would take higher time of clotting and there could be considerable blood loss. 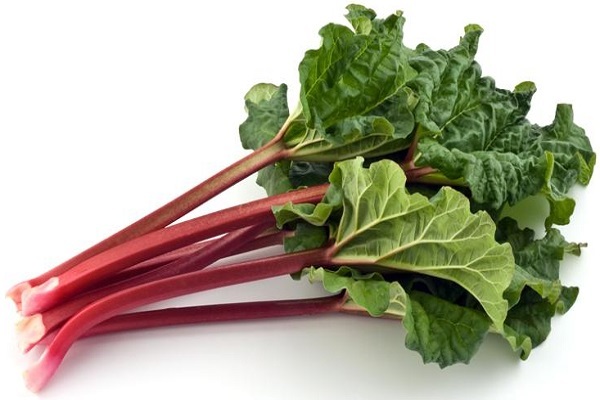 One cup of it supplies 35.7 mcg of Vitamin K.
The antioxidant present in red deep color of rhubarb promotes good health and prevents diseases. It contains several antioxidants such as anthocyanin and lycopene. The stronger antioxidants help in promoting the health of your heart, body’s immune system and eyes. They are also helpful in preventing cancer. When they are cooked then they are providing lycopene, but raw rhubarb are supplying none. A single cup of the chopped rhubarb is going to provide 2.2 grams of fiber, which is 9% of the 25 grams for the daily requirement for value. Fiber is an indigestible compound, which prevents and is relieving the side effects with regards to constipation and by promoting the movement with respect to intestine for propelling the elimination of waste. It provides the bulk in the stools, which are absorbing the by-products for the normal movements and then removing them from your body part. In single serving, there is around 10 mg or around 17% of the 60mg on the daily basis, which is the required amount of Vitamin C. Vitamin C, is also responsible for building collagen, which is a structural compound for the body tissues and is needed for the repair and synthesis for the new and blood vessel tissues. Rhubarb is also the source of potassium and one of the crucial responsibilities for potassium is working along with sodium for regulating right amount of fluids in your body. The body fluids influence the blood pressure. A person should always try to have foods, which is rich in potassium as it is important for preventing the blood pressure. The researchers have found that the highest levels of the poly-phenols found in some slow cooked food and baked rhubarb. Forty-two types of phyto-nutrients and chemicals are present in rhubarb. The chemical profile of rhubarb is quite different from the other species. It is also found to have different effects on different types of poly-phenols. Rhubarb has mild laxative action. It is quite natural and has been traditionally used for the treatment of the constipation without creating lazy bowels. Lazy bowel is considered as the common side effect of the repeated use of the over the counter laxatives. This action is due to fiber and phyto nutrients present in the rhubarb. Rhubarb has antiviral effects. Due to these effects, it has been used in the traditional pattern of Chinese medicine. The antiviral compounds present in rhubarb are now under research through the western medicines for specially treatment of Hepatitis B as well as sever acute respiratory Syndrome (SARS). The stalks of rhubarb contain a small quantity of compounds like beta-carotene, lutein and zeaxanthin. All these compounds convert into Vitamin A and deliver the similar effects of Vitamin A on the body. The rhubarb stalks also contain healthy minerals like copper, iron, potassium, calcium and so on. Rhubarb might cause some of the side effects, which might result into intestinal and stomach pain, uterine contractions and diarrhea or loose stool. Its long-term use could result into weakness, bone loss, irregular heart rhythm, potassium loss and muscular losses. Rhubarb is probably unsafe for the children in extract form, so stay on safer side to avoid use in medicinal amounts in children. As the leaves of rhubarb contain the oxalic acid, which is quite poisonous. Rhubarb leaves consumption may lead to oxalic acid poisoning, which is characterized by symptoms such as blisters, abdominal pain, kidney problems, mouth pain, low blood pressure, weak pulse, nausea and vomiting. Rhubarb is a Canadian favorite food. It is most significant health benefit was the ability of promoting detoxification and its power of astringency. However, its leaves should not be consumed in excess amount because they contain oxalic acid.